These domain names seem to be pending delete, and I could be wrong, but I do not believe they can be renewed at this point. 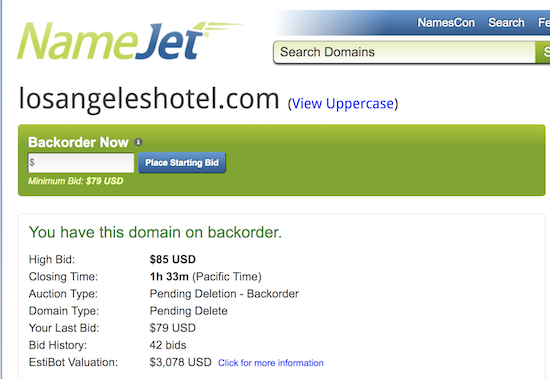 There are other hotel related domain names not included in the list above that appear to be in a similar status. The domain names show the registrant as Six Continents Hotels, Inc. This company operates well-known hotel chains around the world, including Intercontinental Hotels, Crowne Plaza, Holiday Inn, Holiday Inn Express, and Staybridge Suites. These domain names are registered at MarkMonitor, and they will likely go to auction at the drop catching platform that catches them individually. I don’t believe MarkMonitor has a relationship with any of the drop catching auction platforms. There are many backorders at NameJet for most of the domain names, and I presume the other platforms also have significant interest from their participants. I don’t know why the company would decide to let these domain names go. They could be used simply to forward any traffic to a specific local hotel or to the corporate website. Even though they aren’t on-brand from what I can tell, they could have sold these domain names prior to expiration. I believe MarkMonitor handles domain name sales on behalf of its clients who wish to sell their domain name assets and there seems to be quite a bit of interest in them judging by the number of backorders. I backordered several of these domain names and might be an active bidder. It will be interesting to see how much these domain names are worth to domain investors (primarily) on the wholesale market. From the looks of it, these domain names will sell for quite a bit of money, so the fact that they in an expired status is puzzling to me. Those are some good names.. I own SouthThailandHotet.COM got plans for that one. No need for anyone to share their hotel names. Hahahah domainers just can’t resist. I am sure someone with development chops can build an affiliate site and monetize. Personally I think these are almost too generic to really do much with. Some are decent but others like MemphisHotels.com or NashvilleHotels.com…I don’t see the real life usage. People won’t be typing this in. So you think HollywoodHotels is just decent ??? Most people use those price comparison sites to look for hotels these days. I can’t say I’ve ever seen a geo domain being used for this. So why is Domaining censoring your weekly brokerage listing and TheDomain but not the DShame self serving listing? Is it because he likes DShames middle finger better? No idea, but I don’t really do the weekly brokerage listings any longer so I don’t even notice. weekly brokerage listings is the highlight of the blog and I and many many of us love it. I disagree that these domain names have much value in 2018 beyond a couple hundred $. Recent auction sales for similar domains don’t look very inspiring. In the past they were worth more, but no longer as desirable to endusers IMO, hence why these have been dropped. Sure, If I were a hotel chain I might keep hold of them for $8/year, but how much does Mark Monitor charge its clients to renew domain names? The annual saving will likely be more than any sales generated from type-ins. I doubt it was worth anyone’s time trying to sell them prior to expiry. We shall see when they go to auction. I would bet the 10+/- domain names sell for 5 figures in totality. Fantastic Domains They sure do have value its totally crazy to drop them. Can tell you whats happening. Hotel companys hire branding experts who then tell company domains are debranding your own brand then hotel company drops the domains. Looks like $10k +/- in so far just on NameJet. Looks like you were correct about the auction prices. I can’t see who a domainer could sell to at a profit though? A hotel chain? They are done with trying to outrank/out-market OTAs (Booking.com, Expedia, Google Hotels etc) and in any case would promote their own brand over a generic domain name. These dropped domains are a case in point. Are there any examples of a hotel chain buying generic domains like this in recent years? The development angle – this is domainer wishful thinking. Unless you are an OTA with a multi-million dollar Adwords budget, Google won’t let you see page 1 in this niche. You could certainly be right, but there are people who would be happy to try their hand with development. They’re mostly too rich for me.